Turkey's president has been fined for making disparaging remarks about a statue in 2011. President Recep Tayyip Erdogan, who was prime minister at the time, described the Statue of Humanity as a "monstrosity" and suggested it should be removed. The monument was designed to symbolise friendship between Turkey and Armenia, and featured two 30-metre-high human figures facing each other on a mountain above the eastern city of Kars, close to the border between the two countries. 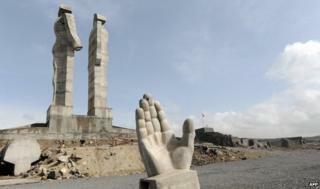 It was never completed, and was demolished a few months after Mr Erdogan made his remarks. An Istanbul court has now ruled that the president must pay sculptor Mehmet Aksoy 10,000 Turkish liras ($4,000; £2,500) in damages, the Hurriyet Daily News reports. Mr Aksoy had sought 100,000 liras for the "insult" to his work, but Mr Erdogan's lawyer argued the comments were more of a critique. In 2014, the Turkish Language Association told the court that the word Mr Erdogan used - "ucube", which can be translated as monstrosity or freak - is not an insult. It said the exact meaning was "very strange and very ugly".